In this dexterity game, players will try to create works of art with the 60 different wooden pieces. The game will be played over three rounds – described as a World Tour – as each of the rounds is based in a different city. The goal in each city is different, though there are some basic rules that apply regardless of the city. 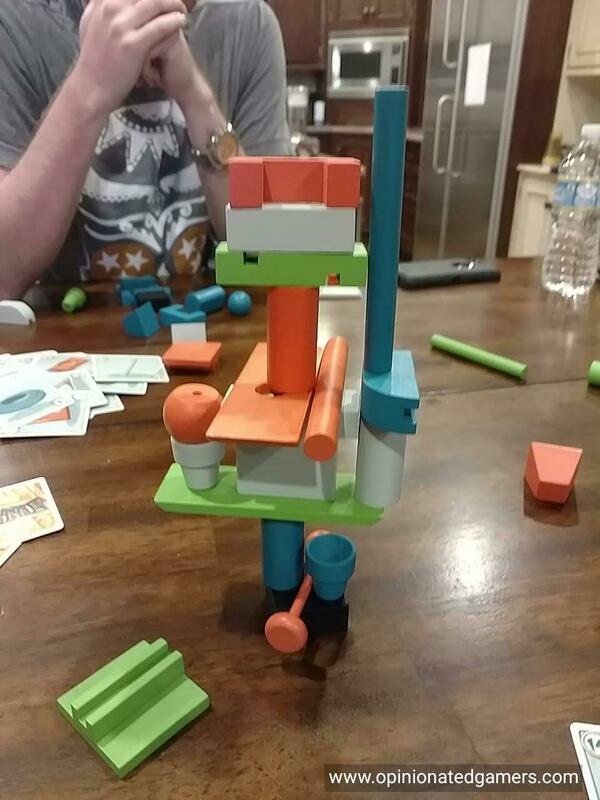 There is a deck of 60 cards, one for each of the wooden pieces in the game – there are 4 different colored sets of 15 objects. Generally, a player’s turn will start by drawing a card. The piece pictured on that card will become the active piece for the turn. That piece then needs to be located, picked up and then placed onto your structure. Your structure initially starts as a simply black base – and this can be oriented any way you like. You can use your active piece to nudge previously placed pieces in order to improve your structure. The active piece must be placed so that no part of it touches the table. If a piece falls off your structure and hits the table – it is set aside (and dealt with in different ways depending on the city). Each round has its own ending condition, and once this happens, you score the scenario based on the goal stated on the city card. 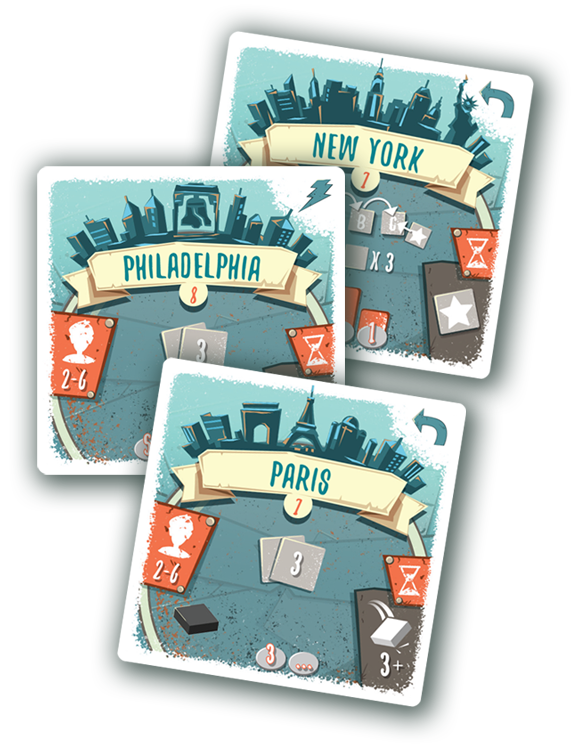 Players will earn victory points (called fans) based on their relative performance in each of the cities. There are 15 different city cards in the box, and each is slightly different from the other. I’ll briefly describe three of the city contests to show how different they can be. 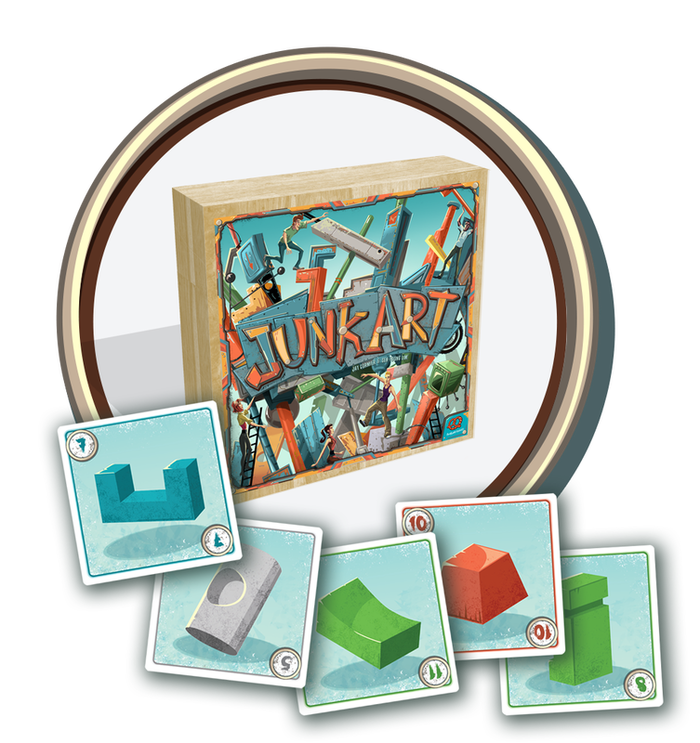 This series of contests would actually be a whole game of Junk Art… The game is played over three rounds, each one from a card drawn from the city deck. Play – At a signal, all players play simultaneously – flipping up the top card of their deck and getting that piece and placing it on their structure. Once it is placed, you flip up the next card and place that piece. If a piece falls off your structure, you need to replace all fallen pieces one at a time until all pieces are off the table. The players race to get all 10 pieces in their structure. As soon as someone has completed the task, they announce it, and all players immediately stop placing pieces. Scoring – 5 fans for placing 10 pieces, 3 fans for 7-9 pieces, 1 fan for 5-6 pieces. A 1 point bonus is given to the tallest structure. Play – On your turn, choose one of your cards and play it in front of the next player. That player must find the matching piece and then play it to the common structure while the first player draws a new card to bring his hand back to three cards. If any pieces fall, you collect them and place them in front of you. As long as you do not have 3 or more fallen pieces, you now give one of your hand cards to the next player and watch him place the selected piece. Once someone has 3+ fallen pieces in front of him, the round ends, and that player is eliminated. Scoring – 3 fans to every player except the one who was eliminated. Play – on your turn, look through your hand of cards and place a card of your choice facedown on the top of that deck. Then, take the entire deck and pass it to the player on your left. Once each player has a new deck, flip over the top card and place the corresponding piece to your structure. If any pieces fall, they are simply moved out of play – there is no other penalty for fallen pieces. Then, take the remaining cards in your deck, choose one to place on top and give that to your left hand neighbor… This continues until all the cards have been used. Scoring – 5 fans for the tallest structure, 3 fans for the second tallest, 1 fan for the third tallest. This is one of those games that I have loved from first sight. I’m not usually a fan of dexterity games because they are generally one-trick ponies, and I quickly tire of the gimmick in them. However, while you want to stack the varied pieces in every version of the game, the variety of goals and gameplay offered in the different city cards makes this one stand out from the genre. Some rounds might be speed building, some might stress the drafting of cards, and there is even one version that is a trick-taking game! There is also a scenario (which I have not played yet) which uses the pieces from Flick ‘Em Up! In any event, while every gamer will likely have some city scenarios which they detest, they will also probably have some that they love – and with each round lasting 5 to 10 minutes, there’s always something to love or to look forward to. Having played a number of times, the only thing that I have found that works better for us is to not draw the new next round card until the previous round has finished. Otherwise, if you know which competitions are coming up later in the game, you might be tempted to figure out the scoring of those versions and meta-game the system. It seems to be a bit more suspenseful to have the next city be a surprise. Of course, YMMV, and the rules tell you to draw the three cards at the beginning of the game. For those of you thinking of bringing this back home from Essen, be forewarned that it is hefty! The game has the soon-to-be-standard Pretzel Games wooden box (just like Flick ‘Em Up). When you add the weight of 60 chunky wooden pieces and 4 bases, it’s definitely something that you’ll want in your carryon luggage! Chris Wray: I’ve played this a couple of different ways, and every play has been simple, laugh-out-loud fun. Dale’s review is spot on: whereas most dexterity games have one way to play, this has several, and that makes it highly replayable for an entry in this genre. I enjoyed my plays at Gen Con, and I’m looking forward to picking this one up. Ted: This is an inventive entry into the dexterity games space with a great, almost obvious theme and really well-done components. I’ve always loved the Zoch classic dexterity games (Hamsterrolle, Bamboleo, Villa Paletti, Riff Raff, and Bausack), but their limitation of a single kind of dexterity mechanic each (and fuzzy rules) was always an issue. Junk Art solves this problem in a very creative way, by having each game consist of three different dexterity challenges. Lots of replayability and very accessible to non gamers. Mary Prasad: So far I’ve only played the game one time but it was a lot of fun. 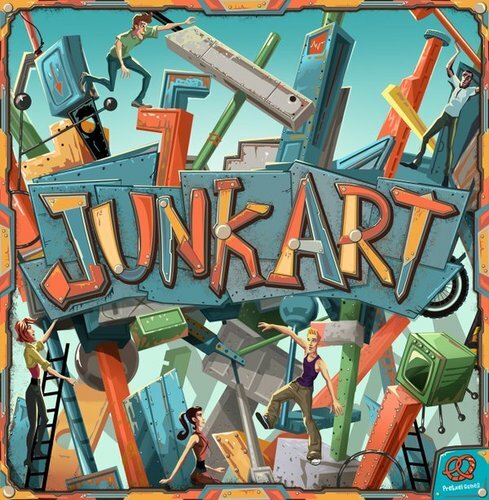 Junk Art is very engaging, the game itself is a work of art, and it is easy to both learn and teach. I’m looking forward to trying the other variants. Dan Blum: I’m not a huge fan of dexterity games in general, but this is a pretty good one. The variety in the cards makes it more interesting (at least to me) than games such as Bausack which it otherwise is similar to. How similar is it to Bausack, which also includes different types of games in its rules (that one could presumably put on cards and draw at random)? I do like dexterity games, as they are quick and good attention-getters at open gaming events, and I will have to check this one out.